Following Mario Maker’s huge success, fans clamored for other Nintendo franchises to adopt easy level-creation tools. “Zelda Maker” seemed like a no-brainer, until Nintendo itself suggested such a game would be difficult to pull off. One game developer took that response from Nintendo as a challenge. “I thought, if Nintendo this it’s too difficult then I’ll prove to them that it’s not, and I’ll make it happen,” Justin Sink, a hobbyist game creator, told Kotaku. So in 2015, Sink got to work within Game Maker to craft a design suite that anybody could use to make a Zelda game. Just like Mario Maker, you could place elements such as enemies and landscape sprites anywhere on the digital canvas. Sink released an early version of the tool as “Zelda Maker” online, Link included, and the game blew up. People wanted to play something like Zelda Maker, they loved the idea of it. Nintendo did not. The videos where Sink showcased Zelda Maker got copyright claimed by Nintendo on YouTube, which in turn blocked everyone from viewing the footage. 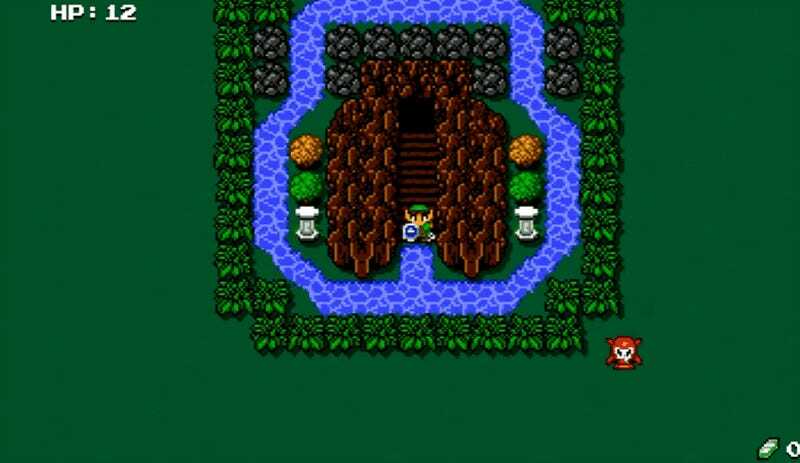 Zelda Maker’s alpha also got dinged, as MediaFire, the file-hosting website that helped Sink disseminate the game, received a DMCA notice over copyright infringement. Zelda Maker, along with the original proof of its existence, had to be taken down. Runiya hopes to take a “realistic approach” to fantasy stories, and to that end has you playing as a fallen angel who saves the people from the Rapture. In order to differentiate itself from Zelda Maker, Sink decided to use a more limited color palette on 16x16 sprites inspired by real-world shapes. The music, meanwhile, takes cues from Sega Arcade and Genesis melodies, all filtered through Game Boy-esque sounds. Working within these limitations is almost like a game onto itself, Sink said. To fund all of this, Sink set up a Patreon where people provide monetary support for his new project. Donors can download early builds of Runiya, which comes packed with its own “Maker” mode that players can use to build and share levels with others. “I’ve improved a lot of what Mario Maker tried to do by putting UI objects into categories, like foliage, enemies, buildings, NPCs,” Sink said. “I will be giving the creator more control than what Mario Maker gave, like changing music, changing weather, creating special events, adding NPCs with dialogue, [and modding]” Sink said. He’s already noticed other players creating an unofficial Zelda mod for Legend Maker, ironically enough. When internet commenters see news of a fan game being shut down, one of the most common responses is “why not make your own game?” The reasons are often complicated, but undeniably, pitching games based on known properties makes people take notice. “I wanted to prove to Nintendo and a bunch of fans out there that [Zelda Maker] could be done, and if I had of started off with the name ‘Runiya’ people wouldn’t get that point, at least not as easily,” Sink said. With the legal threats and development hell in the rear view mirror, Runiya has finally started to stabilize in 2017. Nowadays, Sink looks back on 2015 as a learning experience that helped him define his current design philosophy.